This Cala Llonga Map shows popularBars, Restaurants, places of Tourist interest &Transport locations Click the name in the right column below to highlight the location on the map. 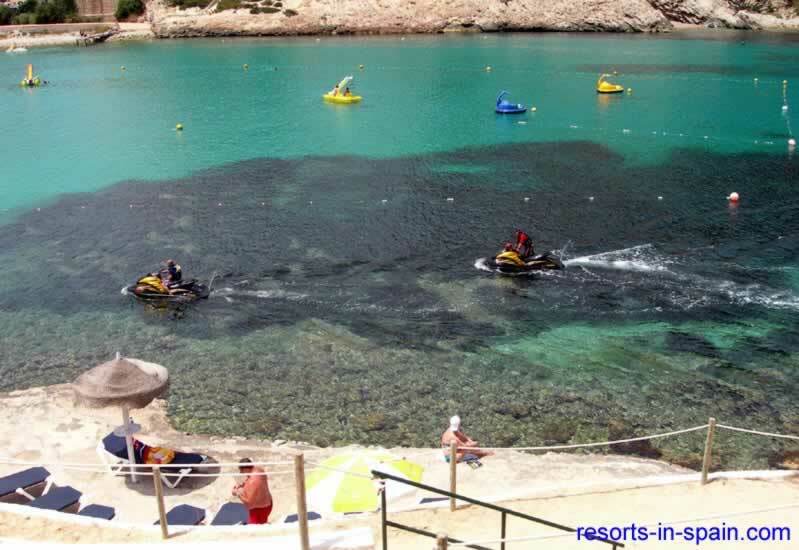 Cala Llonga is a small but beautiful resort located at the end of a narrow bay approximately 800 metres long and 200 metres wide at the beach end and 350 metres wide at the sea end. The sides of the bay are densely wooded with pine trees on the south side. The north side the tree are not as dense with more rocks and scrub land type vegetation. 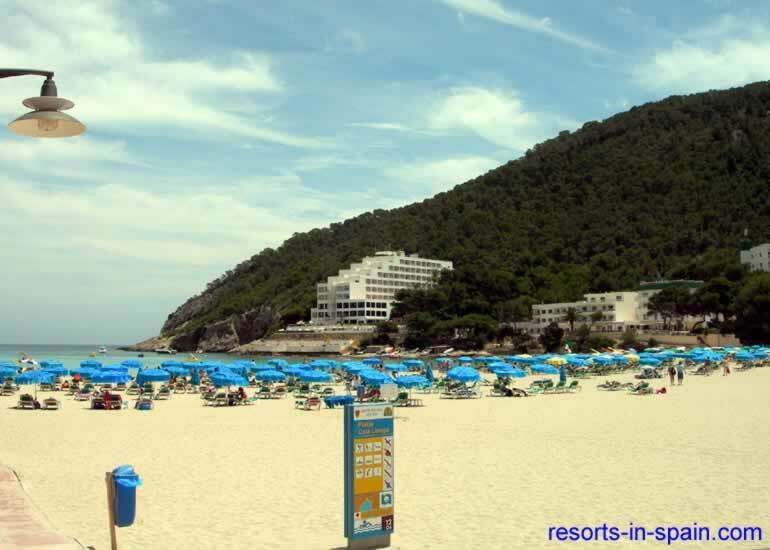 Cala Llonga is the ideal resort for a quiet holiday nightlife is limited to some bars and restaurants, some run by friendly British residents, while days can be spent relaxing on the golden sands of the cove. 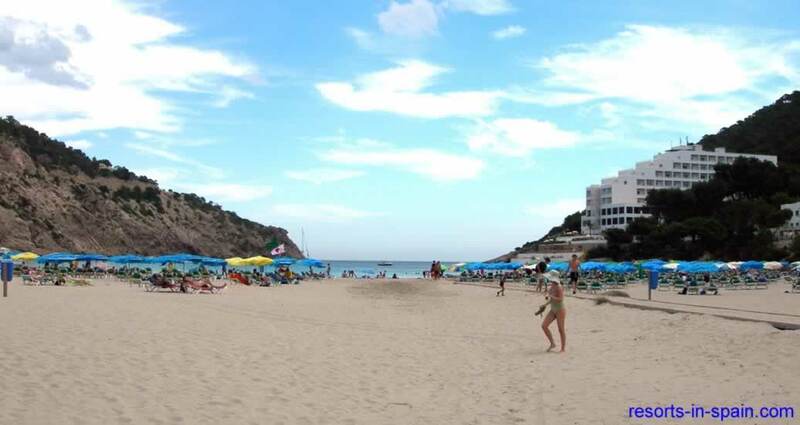 Cala Llonga is located on Ibiza’s east coast at the western end of a narrow long bay, 12km north east of Eivissa (Ibiza Town) the capital, and 7 km south of Santa Eulària the nearest town. The airport is 15km away. 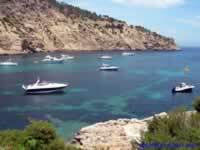 There are 5 ways to travel to Cala Llonga from the airport. This method of travel is the cheapest alternative but if you have suitcases it is only viable if your hotel is located near the Calla Llonga bus stop . 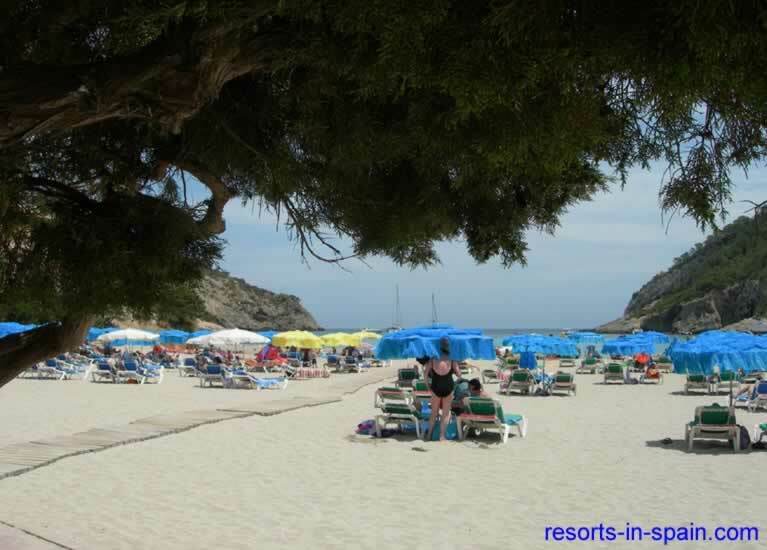 Cala Llonga beach is at the western end of a beautiful long, narrow & sheltered bay, with a splendid, gently shelving sweep of golden sand, making it perfect for adults to relax on. The gentle slope of the beach continues into the sea, making it ideal for kiddies to paddle or swim in. Unfortunately the bay does some times get quiet a few jelly fish. 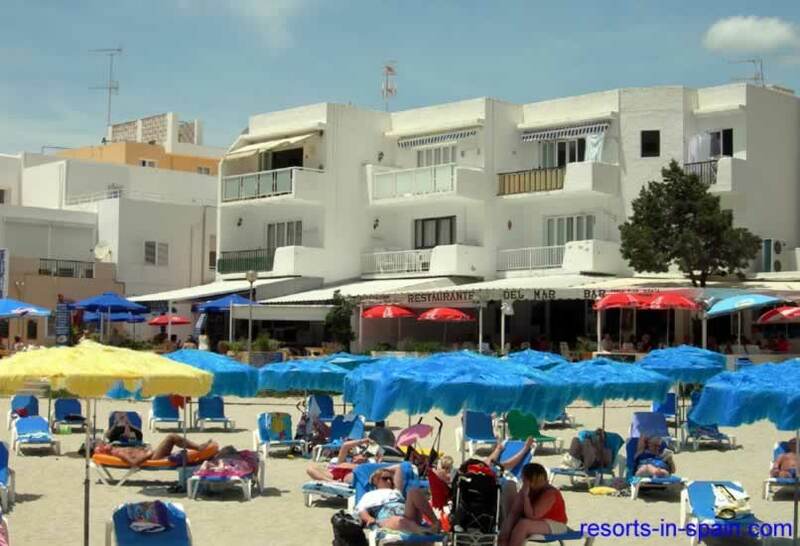 Spend your days lounging on the available sunbeds and adopting the true relaxing Mediterranean lifestyle, while children can build sand castles to their hearts’ content in the fine golden sand. There are also a variety of water sports on offer, too. The spanish are very good managers of beaches and they are cleaned every night, keeping this great beach spotlessly clean. Jelly fish sting first aid treatment. Wash off any remaining tentacles with white vinegar (acetic acid) avoid vinegar going into eyes if stings are on face. Salt water can be used if no vinegar. Do not use fresh water which activates more stinging cells. Rescuers should wear protective gloves to physically remove tentacles. Snorkeling. Better snorkeling. is available in the rockier areas. 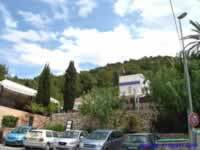 The bottom row of the sun terraces in front of the Calla LLonga hotel is a good starting point. 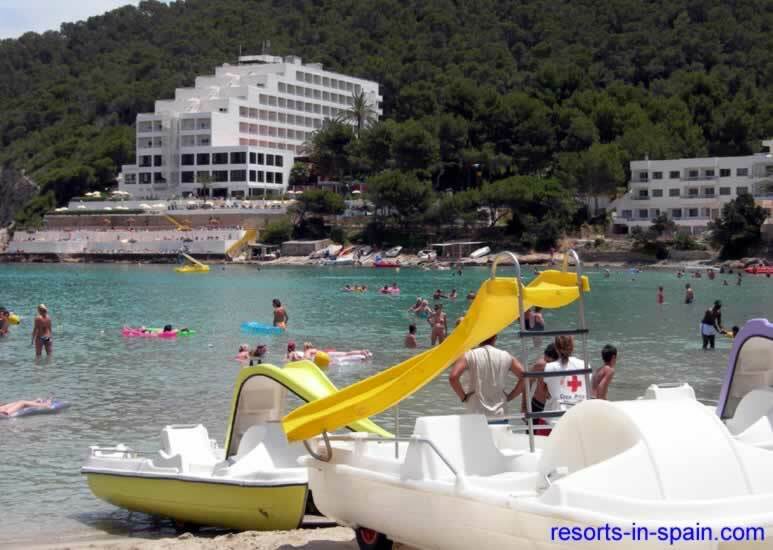 There is a Summer months Beach Hopping Ferry service from Cala Llonga, which visits some of the local beaches, Santa Eularia, and Ibiza. Being a small resort Cala Llonga is not a shoppers paradise. There are sufficient shops for the essentials and for most items you forgot to pack. Those interested in shopping will be pleased to know that Ibiza has a long tradition of potters and a shorter one of jewellers who came to the island in its artists' colony days. If you want something a little more ethnic, then try the famous hippy market in nearby Es Canar. 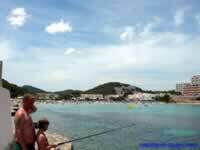 For the more serious shopper there is Ibiza town which is well worth a visit and boasts a large variety of shops. 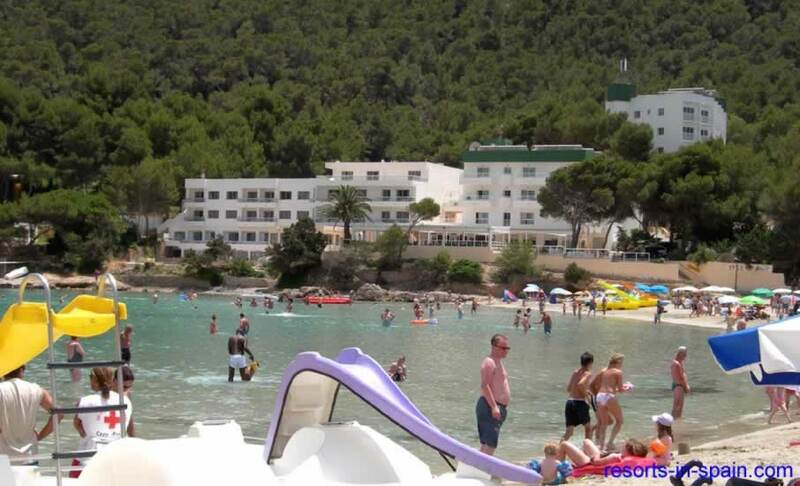 The resort of Cala Llonga is not known for it's nightlife. 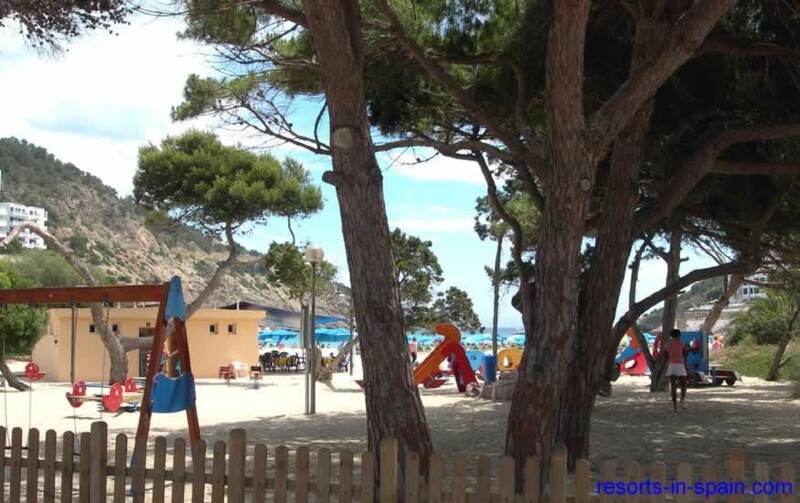 You will certainly find bars with entertainment and good restaurants to eat in, but Cala Llonga is geared towards a more relaxing holiday. If you want the absolutely fabulous discos and clubs that are on Ibiza then you need either a car, taxi or choose another resort.. There are no Disco bus services from Cala Llonga. Try the local liqueur 'hierbas' as you relax in one of the bars or restaurants, some of which are run by friendly British residents. Most of the hotels have good nightly professional entertainment and are usually open to non residents. There are a few discos on offer locally but for a livelier night out visit the nearby, ultra glamorous Ibiza Town. 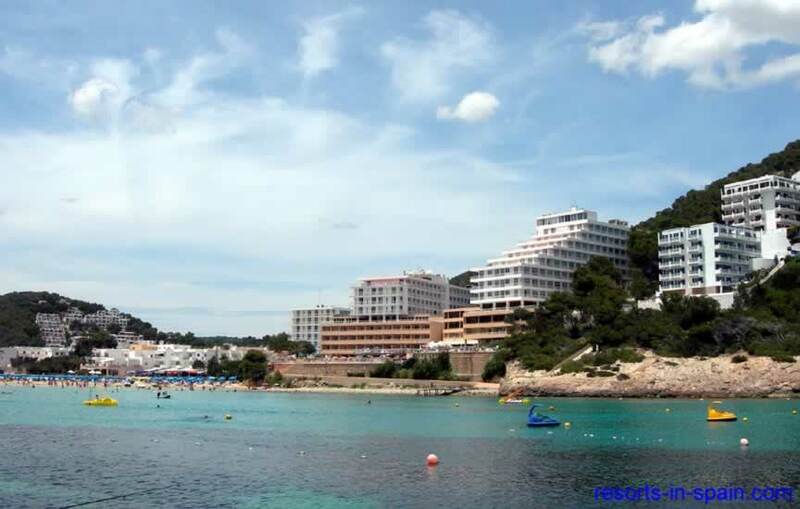 There's a selection of bars, cafes and restaurants in Cala Llonga. 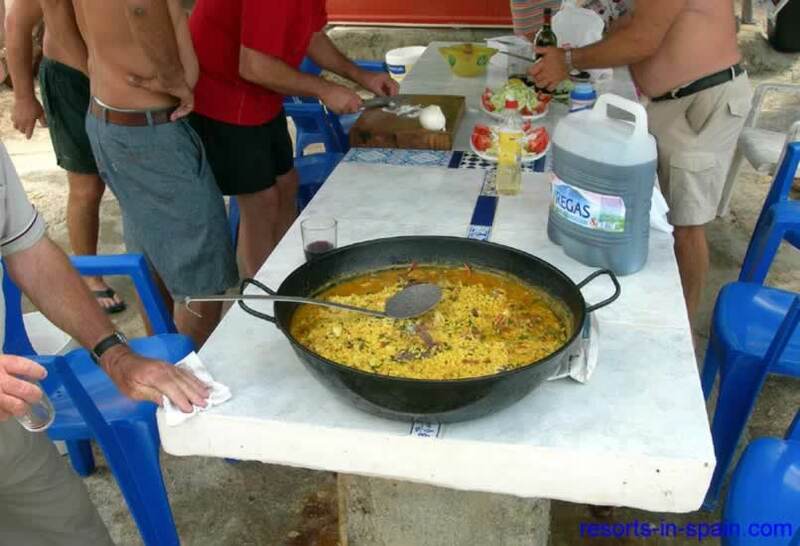 Fish, inevitably, features on most menus and the locals use it to make some tasty stews. Cinnamon and cloves are used in a number of dishes, not least the highly sweetened desserts. The drinks native to the island are made from herbs and aniseed. 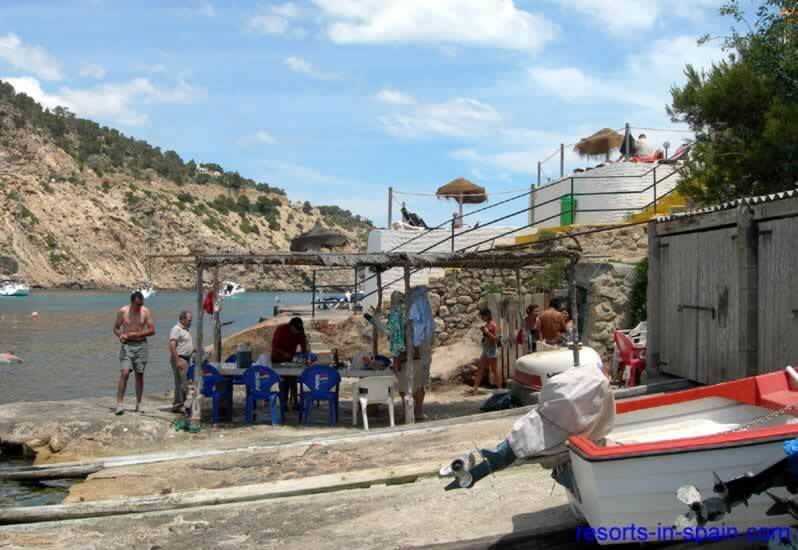 Mr Cairos Show bar is a fun bar that must be visited if staying in Cala Llonga. Possibly stays open the latest of Cala Llonga bars at around 2am 4am. Popular with all ages. In the resort centre, just off the main road lhat runs into the town, along the rear road that leads to the Sirenis Cala Llonga Resort Hotels. Like most places this is also a bar. 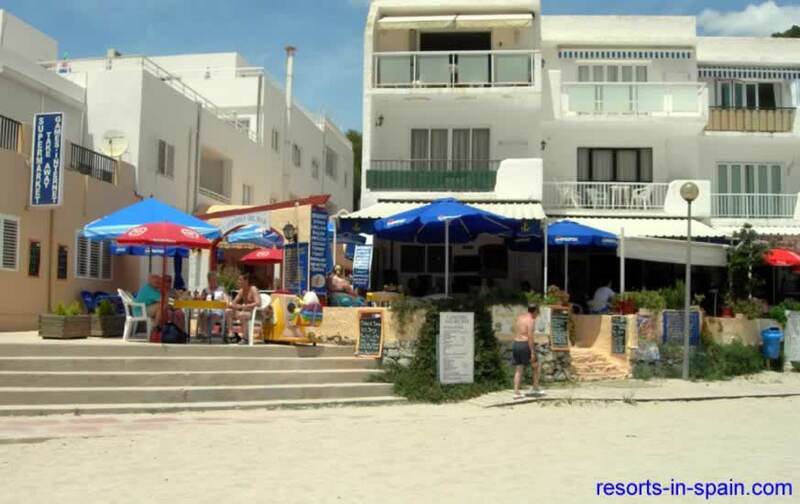 The Cafeteria del Mar is in a great location with only 5 steps directly down onto the golden sand beach. The El Pinar restaurant has an indoor and outdoor terrace set slightly higher up the hillside which gives fabulous views over both the beach and the bay. Try the grilled wild mushrooms or rabbit & monkfish cooked in Champagne. The ugly looking monkfish has supreme flesh and used to be sold as breaded scampi in the UK until trading standard officers stopped this fraud. Located just outside Cala Llonga in the countryside. The bar is run by a great English lady who gives you a very warm welcome. This quieter and stony cove with it's restaurant with a sun bathing terrace is well worth a try and its a pleasant walk. 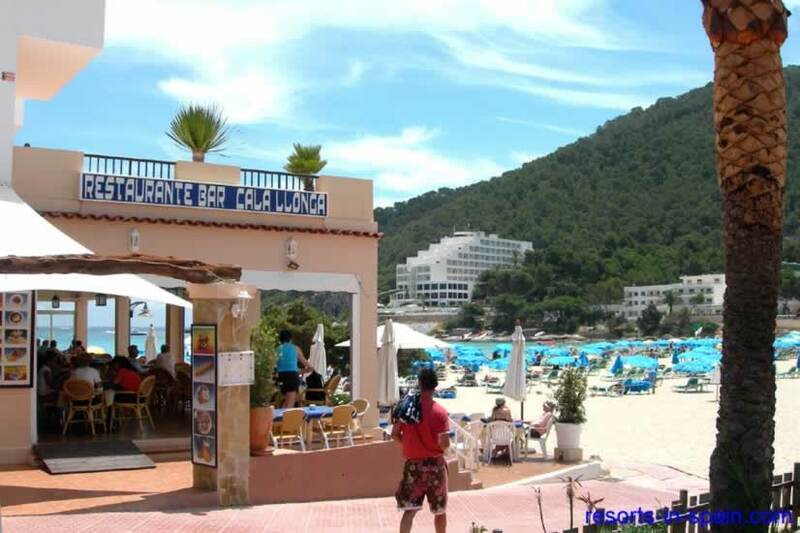 The Sol Den Serra Restaurant is located next to the beach in the next bay south of Cala Llonga, roughly a mile away at the other side of the headland. Leave Cala Llonga on the south western road. keeping the wooded hillside on your left and the more open fields on your right. 2 ferries out late in the morning + 1 late afternoon. 6 ferries in the return direction. 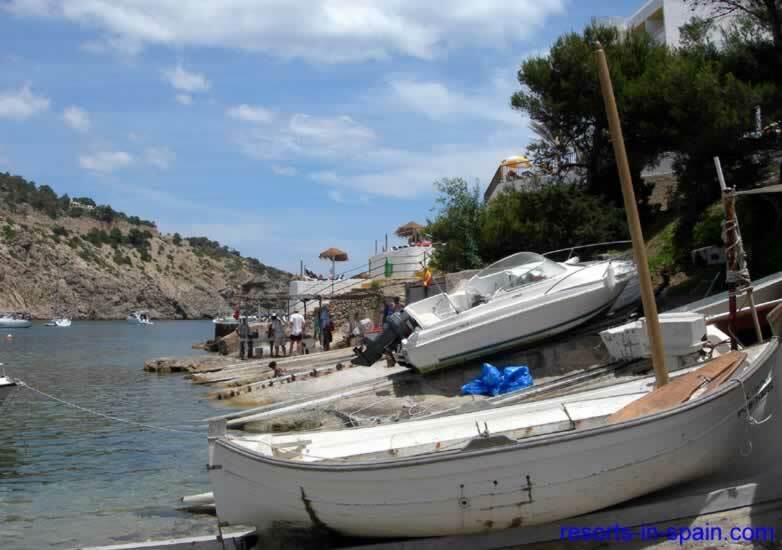 The Cala Llonga Tourist Information Office is located near to Cala Llonga Beach.